Word Up! It’s the Writing on the Wall. January 5, 2011 February 11, 2012 Diana B. When I was a small child, I loved to play quietly, all alone in my bedroom. Sometimes I’d play there contentedly for hours. My mother used to say that’s when she would worry about me most. Evidently, sometimes I was “up to no good” all alone in that pink room at the end of the hall. My confidence sounded a bit sassy, I suppose. That’s the day I learned that my bedroom actually belonged to my parents. They had paid good money for it, and while they generously allowed me to sleep there, those four walls actually did not belong to me. That’s also the day I learned that we only color on paper. It’s a good household rule, and it’s typically upheld in my current home, for which my husband and I are paying good money. Those pictures and letters I wrote on the pink painted drywall of my childhood bedroom were erased somehow. My daddy probably had to paint over them, and I never did write on those walls again. But my urge to write on the wall was never erased. And thankfully, there seems to be an exception to this household rule. Sometimes it’s okay to write on the wall. At least, sort-of on the wall. A few years ago for Mother’s Day, my husband and children painted three large canvases with black chalkboard paint and hung them up on our dining room wall. Now, to my great joy, I get to write on the wall! And what’s more, I have the confidence of knowing that Scripture encourages such behavior! Okay, so a wall isn’t exactly a doorframe, but it’s the same idea. 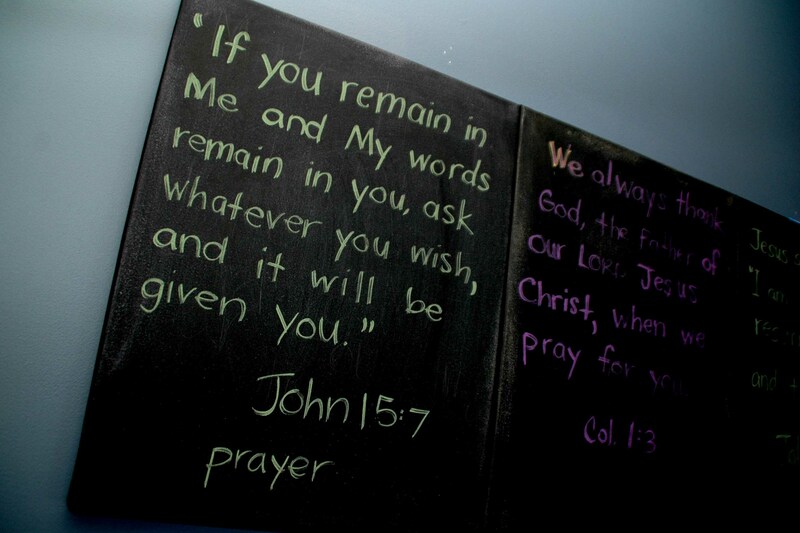 Writing on the dining room wall is a wonderful way to get God’s Word up in my house and uppermost in my thoughts. It’s really a tool for Scripture memorization. As I sit at the table with my children, three times a day, I can stare at those words just like I used to stare at the back of the cereal box. I study them. My daughters study them, too. Typically we have three verses up each week — the one I am memorizing and the two my children are memorizing for Sunday School. What a handy way to review these verses with them! I love that Scripture memory allows me to pray God’s Word over my children, use His Word to fight the enemy’s lies so I can resist the temptation to sin against God, and meditate peacefully as I drift off to sleep. What’s more, two of my earthly heroes have much to say about what we, as believers, are to do with the Word of God. First, Ann Voskamp at A Holy Experience offers these three lovely posts on the significance of words and God’s Word: Living into a Good Story, Why Your Words Matter Most and The 7 Habits of Highly Effective Bible Memorization. Also, John Piper offers this post on the Why and How of memorizing Scripture. And he preaches in the video below on why we need to take up the Sword of the Spirit and diligently commit it to memory. The embarassing part is when the girls memorize my memory verse long before I do! Reblogged this on Starlight Writer. That was so well done! I really look forward to reading your blogs. Have you ever submitted such as this to a devotional book? I have several books that I use on a rotation basis, and they always have one brief life example a day to illustrate a particular Biblical truth. You should be published! Oh, thanks for your kind, encouraging words! I’ve actually had about three dozen feature stories published nationally in agriculture magazines, but I’ve had trouble figuring out the right niche for my more personal works. Are there any specific devotional books you suggest as a good fit?